Egypt’s President Abdel-Fattah El-Sisi discussed on Tuesday the issue of terrorism in the third meeting of presidents of African constitutional and supreme courts. The meeting also discussed the role of the judiciary in fighting corruption and protecting human rights, spokesperson of the Egyptian presidency Bassam Rady said in a statement. 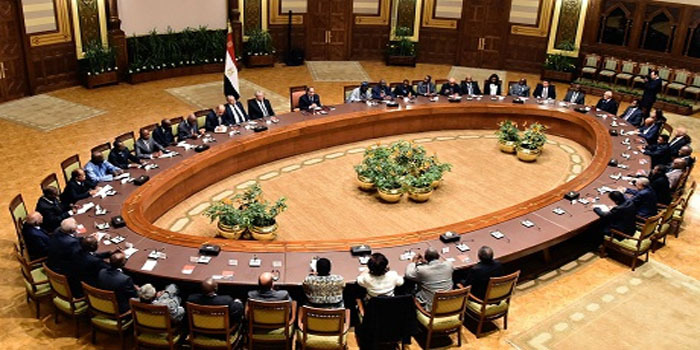 The conference, which is the third to be convened in Cairo, comes shortly after Egypt assumed the presidency of the African Union earlier this month. El-Sisi stressed the importance of strengthening the role of law and justice in African countries, which share common challenges such as terrorism and extremist thought. The Egyptian president highlighted that terrorism is one of the most serious challenges facing the world. “Combating terrorism is one of the most important human rights, the right to life itself and the sense of security,” El-Sisi said. During the conference, the president of Egypt’s Supreme Constitutional Court expressed appreciation for El-Sisi’s keenness to support the conference’s recommendations regarding activating cooperation between African judicial bodies in the field of education and training of their employees. El-Sisi highlighted that Egypt is ready to share with African countries its expertise in the above-mentioned fields. The Egyptian presidency spokesman also said that Egypt is working to launch a new electronic platform to link the African constitutional and supreme courts and strengthen cooperation and development between African judiciary bodies.